Annual Message to Congress with Documents; Pres. Johnson . 9.Dec. HED 1, 40-3, vl-4, 5552p. [1364-1369] Indian treaties; annual report of theSec. of War (Serials 1367-1368); annual report of the Sec. 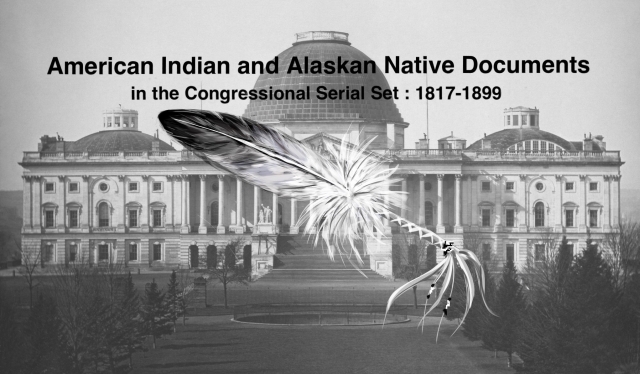 of Interior(Serial 1366); annual report of the Gen. Land Office (Serial 1366); annual report of the CIA (Serial 1366), including Indians in Alaska, the efforts of the Indian Peace Commission, Indian hostilities, transfer of the Indian Bureau, civilization, the Indian war on the southern plains, statistics on trust funds and populations, and reports of Supts., agents, schools, and farms; etc.